Will Tropical Storm Bonnie drench your Memorial Day? 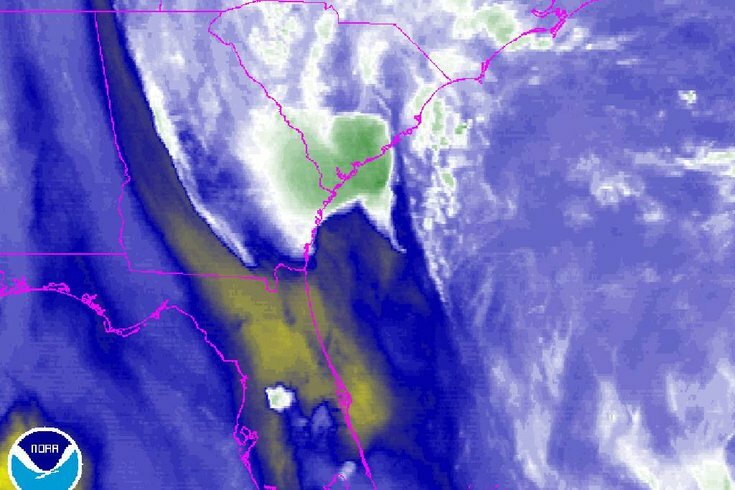 This water vapor image shows Tropical Storm Bonnie stalled off the coast of South Carolina. Heavy rains from Tropical Storm Bonnie soaked the coasts of South Carolina, southeastern North Carolina and eastern Georgia, ruining the start of Memorial Day weekend even as it weakened while moving northward. Top sustained winds of the season's second-named tropical storm decreased to 40 mph Sunday morning, making, four days before the official start of hurricane season in the Atlantic Ocean, according to the National Hurricane Center. Despite losing a bit of momentum, Tropical Storm Bonnie will move north to bring heavy rains to the Philadelphia region on Sunday night into Monday morning. Showers are expected to move into the southern areas of region, including the South Jersey beach towns and the Delaware beaches, as early as Sunday morning, but later in the afternoon in most areas, according to the National Weather Service. Points north of the city could remain dry all day. The heaviest rain should occur in the overnight hours with more than 2 inches of rain possible in many areas, and locally higher amounts possible. Localized flooding is possible. Showers will likely disrupt Memorial Day festivities in the morning before they gradually decrease through the afternoon and evening, forecasters said. The weather service has issued the following forecasts for Philadelphia, the Jersey Shore and the Poconos. Tonight: Mostly clear, with a low around 66. South wind around 6 mph becoming calm after midnight. Sunday: A chance of showers, with thunderstorms also possible after 2pm. Increasing clouds, with a high near 88. Calm wind becoming south around 6 mph in the afternoon. Chance of precipitation is 30 percent. New rainfall amounts of less than a tenth of an inch, except higher amounts possible in thunderstorms. Sunday Night: Showers and thunderstorms likely, then showers and possibly a thunderstorm after 8pm. Some of the storms could produce heavy rainfall. Low around 68. South wind around 5 mph. Chance of precipitation is 80 percent. New rainfall amounts between a quarter and half of an inch possible. Memorial Day: Showers and possibly a thunderstorm. Some of the storms could produce heavy rainfall. High near 81. Southwest wind around 6 mph. Chance of precipitation is 80 percent. New rainfall amounts between a half and three quarters of an inch possible. Monday Night: Showers likely, mainly before 8pm. Patchy fog after 2am. Otherwise, mostly cloudy, with a low around 65. Southwest wind around 5 mph. Chance of precipitation is 60 percent. New precipitation amounts of less than a tenth of an inch possible. Tuesday: Patchy fog before 8am. Otherwise, mostly sunny, with a high near 86. Tonight: Mostly clear, with a low around 61. South wind 5 to 7 mph becoming calm after midnight. Sunday: A chance of showers between 11am and 2pm, then a chance of showers and thunderstorms after 2pm. Partly sunny, with a high near 73. Calm wind becoming south 5 to 8 mph in the morning. Chance of precipitation is 30 percent. New rainfall amounts of less than a tenth of an inch, except higher amounts possible in thunderstorms. Sunday Night: Showers and thunderstorms likely, then showers and possibly a thunderstorm after 8pm. Some of the storms could produce heavy rainfall. Low around 67. South wind around 8 mph. Chance of precipitation is 80 percent. New rainfall amounts between a quarter and half of an inch possible. Memorial Day: Showers and possibly a thunderstorm. Some of the storms could produce heavy rainfall. High near 73. South wind around 9 mph. Chance of precipitation is 80 percent. New rainfall amounts between 1 and 2 inches possible. Monday Night: Showers likely, mainly before 8pm. Patchy fog after 2am. Otherwise, mostly cloudy, with a low around 61. South wind around 8 mph. Chance of precipitation is 60 percent. New precipitation amounts between a quarter and half of an inch possible. Tuesday: A slight chance of showers. Patchy fog before 8am. Otherwise, partly sunny, with a high near 75. Chance of precipitation is 20 percent. Sunday: A chance of showers between noon and 3pm, then a slight chance of showers and thunderstorms after 3pm. Patchy fog before 10am. Otherwise, mostly sunny, with a high near 82. Calm wind becoming southwest 5 to 8 mph in the afternoon. Chance of precipitation is 30 percent. New rainfall amounts of less than a tenth of an inch, except higher amounts possible in thunderstorms. Sunday Night: Showers and thunderstorms likely, then showers and possibly a thunderstorm after 9pm. Some of the storms could produce heavy rainfall. Low around 63. South wind around 5 mph. Chance of precipitation is 80 percent. New rainfall amounts between a half and three quarters of an inch possible. Memorial Day: Showers and possibly a thunderstorm, mainly before 3pm, then a chance of showers and thunderstorms after 3pm. Some of the storms could produce heavy rainfall. High near 78. Southwest wind 5 to 8 mph. Chance of precipitation is 80 percent. New rainfall amounts between a half and three quarters of an inch possible. Monday Night: A chance of showers and thunderstorms before 9pm, then a slight chance of showers between 9pm and 3am. Mostly cloudy, with a low around 57. West wind around 5 mph. Chance of precipitation is 50 percent. New precipitation amounts of less than a tenth of an inch, except higher amounts possible in thunderstorms. Tuesday: Mostly sunny, with a high near 80.